I know Thanksgiving is over, but it’s really not. Not according to the Bible. The Word says these three things are the will of God for you who are in Christ Jesus: “Rejoice always, pray without ceasing, give thanks in all circumstances.” Notice that the Bible doesn’t teach us to wait until we “feel” thankful. The command is to the will, so we don’t “feel” our way into giving thanks; we “give thanks” our way into feeling grateful. I know that is bad grammar, but it is also good theology. So the question is, why are we so often found outside his will? Put another way, what are the reasons we are not thankful? It may be that we ascribe everything that happens in our lives either to luck, to fate, to self-effort or to a mystical combination of all three. The Bible teaches us, however, that God is the Sovereign Lord of all creation, and the giver of every good gift. May I suggest a few practical steps we can take toward developing a heart of thanksgiving? First, make a list of the top 10 things or people on your “I am thankful” list. Second, thank God for each one of your top 10. Each one is a work of God, whether you are thankful for his forgiveness or whether you are thankful for your wife. I love Brad Paisley’s song, “Waitin’ on a Woman.” A young man sits down at the mall next to an old man and they get to talking, since they have nothing else to do: They are waiting on their wives, who are shopping. The old man says, “Son, since 1952 I’ve been waitin’ on a woman. When I picked her up for our first date, I told her I’d be there at 8, and she came down the stairs at 8:30. She said, ‘I’m sorry that I took so long, didn’t like a thing that I tried on.’ But, let me tell you son, she sure looked pretty, Yeah, she’ll take her time but I don’t mind, Waitin’ on a woman.” Then the last verse says, “I’ve read somewhere statistics show, the man’s always the first to go. And that makes sense, ’cause I know she won’t be ready. So, when it finally comes my time, and I get to the other side, I’ll find myself a bench, if they’ve got any. I hope she takes her time, ’cause I don’t mind, waitin’ on a woman.” Hey men, maybe listening to that song once a week would help you be more grateful for your wives, even if they are the “never on time” type. Third, tell the people on your list how much you are thankful for them. They need to hear it. We need to say it. Finally, make a list of every circumstance from this past year that would never come close to making your top 10 list. Maybe you had a health problem. An accident. A broken relationship. A financial setback. Even an election that didn’t go your way. 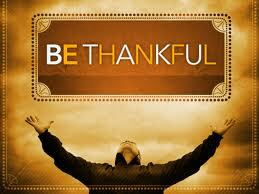 Now, give thanks in every circumstance, just like the Bible says to do. We say we believe in the sovereignty of God. And that he is good and does good. Then we get sick and we cannot believe what is happening. And everything turns inward. Giving thanks in every circumstance is a way of forcing our hands to unclench, our arms to open up, and our hearts to be clear. O Lord, you have given so much to us. Give us one thing more: a thankful heart.